1. Son of Herod and Cleopatra of Jerusalem; ruled from 4 B.C. to 34 C.E. When Herod changed his will in the year 4, shortly before his death, he appointed Philip tetrarch of Gaulanitis, Trachonitis, Batanæa, and Paneas. After Herod's death his elder son, King Archelaus, was obliged to go to Rome, and appointed Philip regent during his absence. Philip himself went to Rome shortly afterward to second his brother's requests, and on this occasion Augustus granted him Auranitis in addition to the provinces already mentioned. The territory over which he ruled was chiefly Greek, although it had been forcibly Judaized under the Maccabees. His reign was a just and peaceful one, and he was friendly to the Romans, as is shown both by the cities he founded and by the coins he struck. He enlarged the old Paneas, at the foot of Lebanon, calling it Cæsarea in honor of Augustus; subsequently it was called Cæsarea Philippi, to distinguish it from Cæsarea by the sea. He rebuilt also Bethsaida on the Lake of Gennesaret, naming it Julias in honor of the daughter of Augustus. He was married to Salome, the daughter of Herodias, but had no children by her. The coins which he struck were the first Jewish ones to bear representations of the emperors Augustus and Tiberius. Philip died during the reign of Tiberius and was buried in a tomb which he himself had built. After his death the territory over which he had ruled was incorporated with the province of Syria, but in 37 C.E. it was restored to Agrippa, a grandson of Herod and the first Mariamne.Bibliography: Josephus, Ant. xvii. 1, § 2; 8, § 1; 11, § 1; xviii. 2, § 1; 4, § 6; 5, § 4; idem, B. J. i. 33, §§ 7, 8; ii. 6, § 1; 9, § 1; iii. 10, § 7; Herzog-Hauck, Real-Encyc. xi. 618; Grätz, Gesch. 3d ed., iii. 247, 269 et seq. ; Schürer, Gesch. i. 425-431, ii. 158-162. 2. Called also Philip Herod; son of Herod the Great and his wife Mariamne H., daughter of the high priest Simon, the son of Boethus of Alexandria. Herod's first will, probably made in the year 6 B.C., designated him as successor in case he should out-live Antipater, but when the intrigues at the court were discovered and Antipater was executed, Mariamne was banished from the court as one of the conspirators, the name of her son Herod was stricken from the will, and her father was deposed from his office of high priest. Herod married Herodias, a daughter of Aristobulus, who had been executed in 7 B.C. His daughter by this wife, Salome, who subsequently became the wife of the tetrarch Philip, is mentioned in the New Testament. 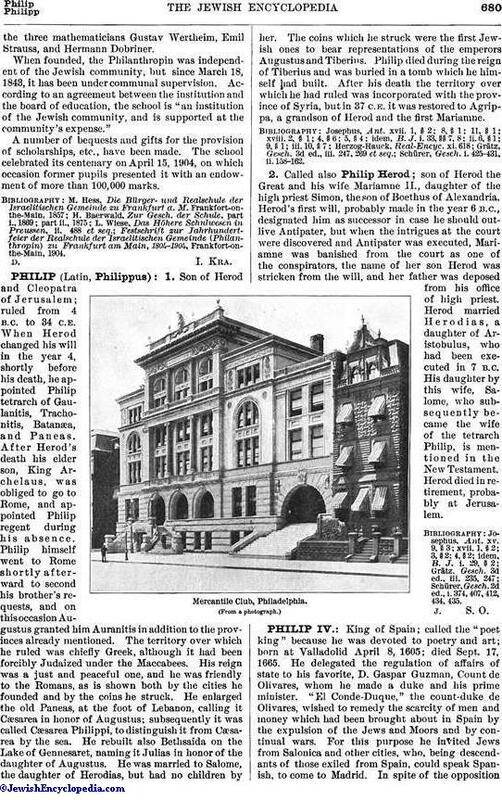 Herod died in retirement, probably at Jerusalem.V09p680001.jpgMercantile Club, Philadelphia. (From a photograph. )Bibliography: Josephus, Ant. xv. 9, § 3; xvii. 1, § 2; 3, § 2; 4, § 2; idem, B. J. i. 29, § 2; Grätz, Gesch. 3d ed., iii. 235, 247; Schürer, Gesch. 2d ed., i. 374, 407, 412, 434, 435.J. S. O.